Sea. Sunlight. Calm. Trees. Laughter. : Francis Irving Sea. Sunlight. Calm. Trees. Laughter. I found another oldish notebook. 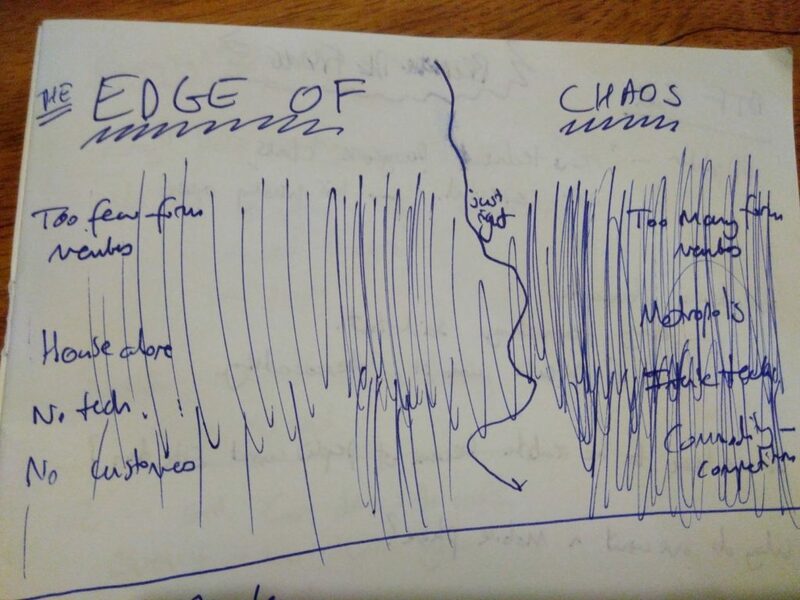 It’s about the edge of chaos. The more lightly shaded left hand edge is absence, null, non existence. The dark shaded right hand side is total chaos, randomness. The sharp line down the middle is the edge of chaos – where things are balanced, interest lies, life grows. 2. “House alone” vs “Metropolis”. Living completely alone gives you no services no redundancy, living in a metropolis with tens of millions of people gives you slums and impossible property prices. 3. “No tech” vs “Intense tech”. Without any technology you’re impoverished. With too much, too fast, you can’t absorb it, polish it, make it fair, its dangerous side is emphasised. 4. “No customers” vs “Commodity competition”. When choosing a product/marketspace to enter you might pick one nobody will care about until after you’re bust. Or, just as bad, you might pick one where there isn’t just competition, but industrialised competition, where it is a standardised commodity impossible to compete with. In every case there’s a balance. The question is, how to viably (with tangled hierarchy?) sustain that balance? A simple feedback loop will eventually steer you off into the void or into the white noise. Everything that is good, everything that is alive, is at such a balance.